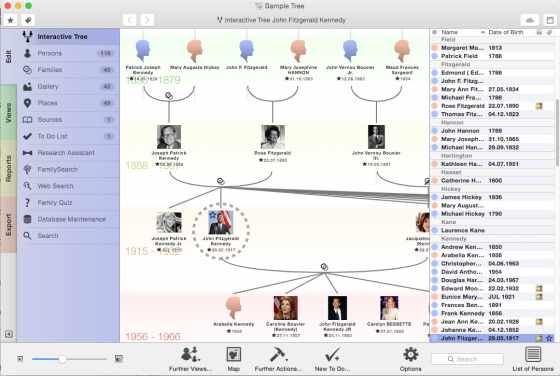 Mac FamilyTree software is, at its most basic level, does just what you would think it would do. It provides a method of creating your family tree, or if you are doing research, someone else’s family tree. But it doesn’t end there and some of the capabilities built into the program can be of great value as well as great distraction. Also, for an owner of an iPhone, there is a companion App that can be very helpful as well. The basic functionality of family tree software allows you to enter who married who and who was born and who they married and so on. Even in days of old when people were more constrained there were the occasional children born out of wedlock, adoptions, divorces, and so on. This is where family trees can get rather complicated but Mac FamilyTree seems to be able to handle all of those conditions rather easily with a bit of experimentation and a few looks at the documentation. One thing that I find most useful, be it with Mac FamilyTree or presumably any comparable software, is to be able to store miscellaneous information about a specific family member and know it was properly associated with that individual.